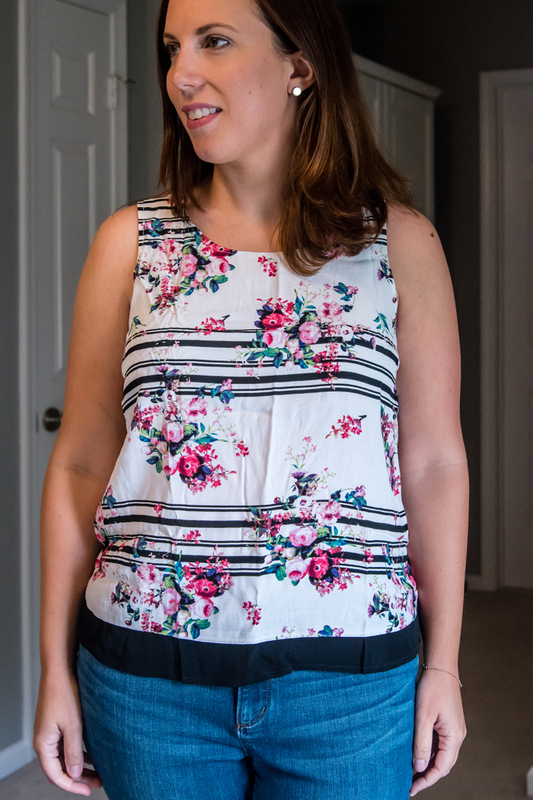 Last Thursday I received my sixth "Fix" from Stitch Fix. I had scheduled to receive them every three months, so it works out that I get a new Fix for each season. This Fix was all about Summer! Keep reading and see what they sent me, what I liked (and didn't), and what I ended up keeping! First let me tell you how soft this dress is! It feels like butter... or maybe more like wearing pajamas! 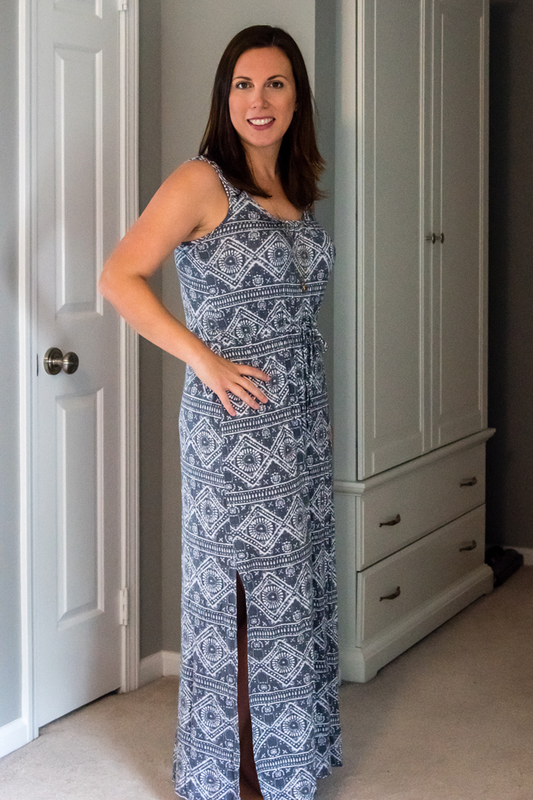 I'm a huge fan of dresses in the summer so I immediately wanted to try this on. And once on I loved it even more! 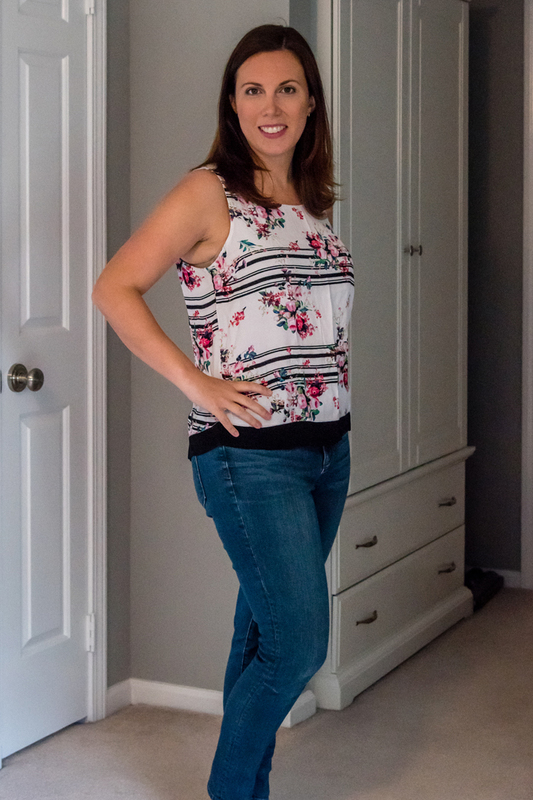 I like that I can wear a easily wear a regular bra, it has a scoop neck without being too low, and has the tie to cinch around my waist. This was a definite keeper! I actually liked this next top, and so did Noah. When I receive a Fix, I quickly try on the pieces and then think about them overnight before photographing them. Noah saw me try this on initially and told me he really liked it. I love that he has opinions lol! There's a camisole built into the shirt and it was not too tight or too loose. I also liked the print and that it's different from anything in my closet. It's honestly the price that got me. I knew I was going to keep the dress, and the idea of spending another $68 made me question it. I was optimistic about this top. I really liked the floral print and the touches of black in it. But it was just TOO SHORT! Don't mind the wrinkles... I didn't want to waste my time ironing once I saw how short it was on me. Oh this top was unfortunate. I actually did like the print, but after that it was just all sorts of wrong. First off, it was too small for me... the buttons were popping at the chest area. Then there was the fact that it was just really sheer. And while the idea of a unique back is kind of cool, it just doesn't work for me. I have to wear a bra and prefer to wear a normal style one. And the back detailing just didn't line up with my bra straps, so it made the back detailing look even sillier. I wasn't a fan of this dress as soon as I pulled it out of the box. I'm not a fan of the print and the material just wasn't that nice. And you'd think at this price the material would at least be nice. To me it felt like a cheap knock off silk. 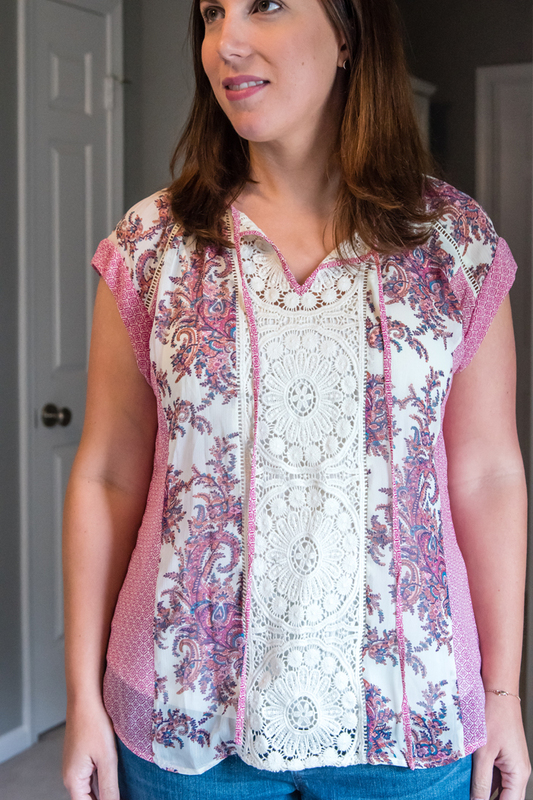 The print combined with the flutter sleeves just made me think old lady living in Florida. Who knows... maybe that's in style now!? What do you think... did I make the right decision??? 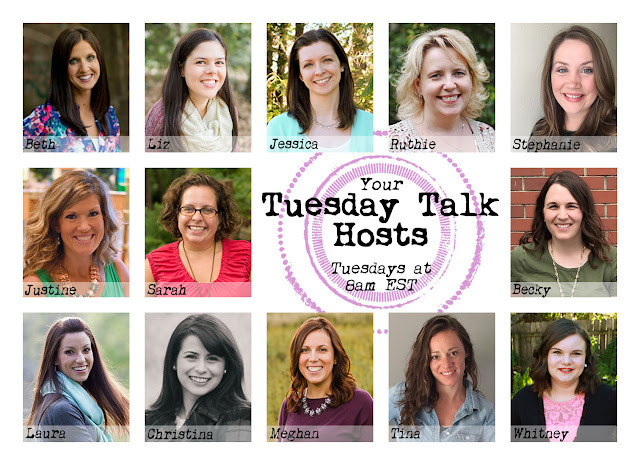 I'm also excited to announce that I will now be a cohost for the Tuesday Talk linkup! I loved your first two pieces! It's hard to pay the same price for a dress and a cap sleeve top so I get why you returned the lace one. It did look great on you so maybe you could find something similar on sale towards the end of the season :) Welcome to the Tuesday Talk group! I agree with you about the pieces! 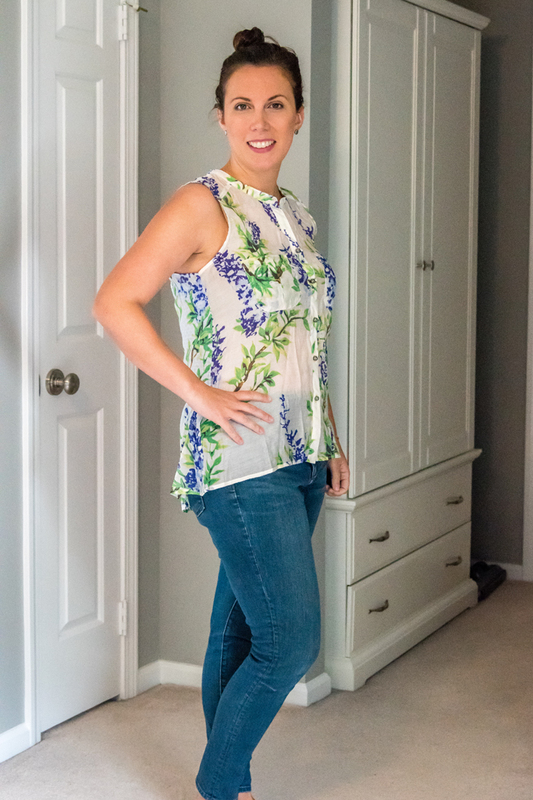 Too bad the clothes are so expensive - that's the one thing keeping me from trying stitch fix! 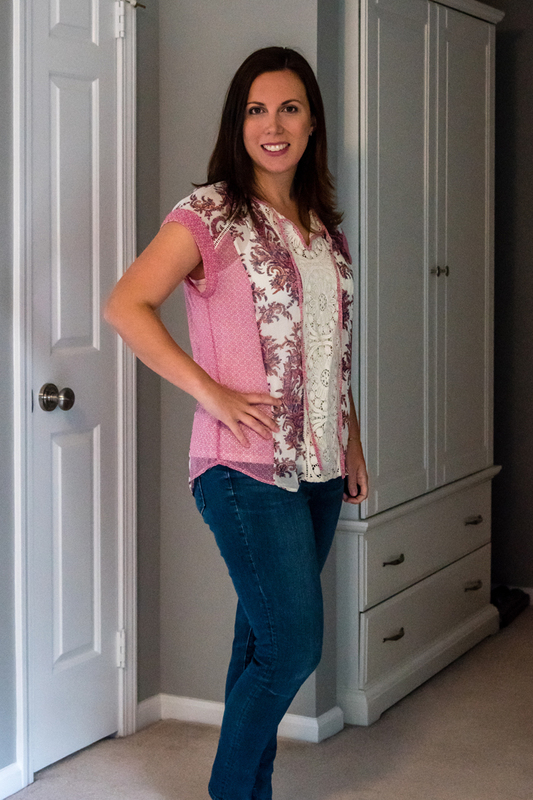 I love all the pieces you got, but I totally get the price issue... that's one reason I haven't done stitch fix... I just don't pay $60 for anything except shoes. I love the maxi and I LOVE that second top, but I don't blame you at all for not keeping it. That is a lot of money for a top, so I can totally see why you didn't keep it. That last dress, WHOA! Yeah, that is not up my alley AT ALL. I LOVE that maxi!! Great decision keeping it. Such a bummer that the Daniel Rainn - Tolley Mixed Print Top was priced a little high. It looked great on you! And I'm a total stickler for patterns and prints lining up where they are sewn together. So, when the Pixley - Herbert Scoop Neck Blouse didn't line up I was glad you returned it. For $54 the prints should align! I agree with your choices. 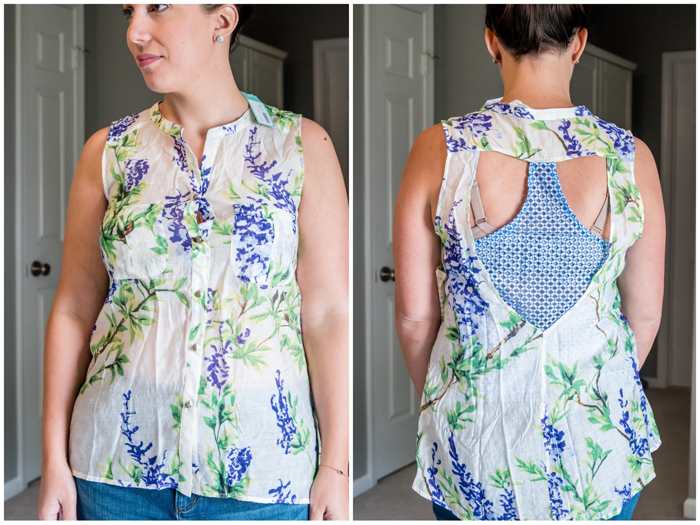 I love that ARATTA top in the front, the print is GORGEOUS but the back is so weird! To me it looks like a mistake. Also the last dress is odd, I agree. 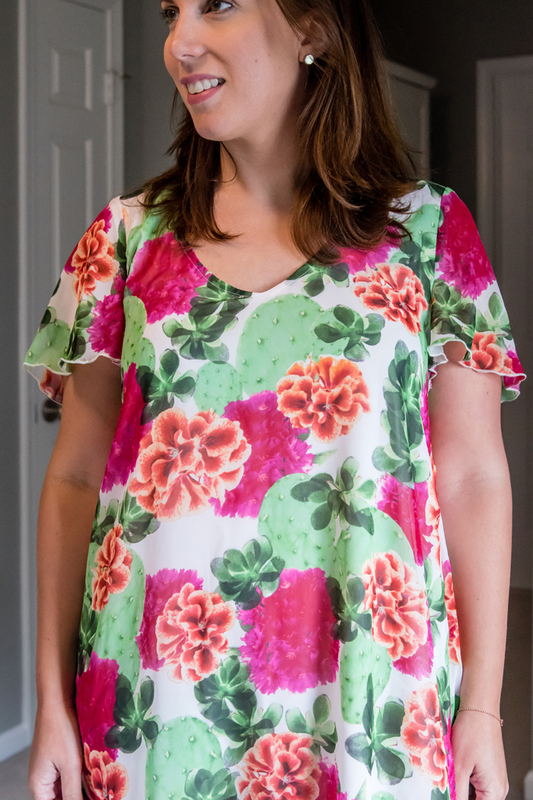 I get that cacti are in but that's just a strange choice for a print/dress for a young woman. That Abella Maxi dress is gorgeous and looks like it was made for you! Bummer the scoop neck blouse was too short. I really like the print! I definitely agree with your choices. I really need to get to an Old Navy soon. I love everything you get from there. Love the dress you keep, but I'm obsessed with that Daniel Rainn top of you! Nordstrom (and the Rack) often carry that brand so perhaps you could snag it on sale at some point! I love the dress you kept! So pretty! I really loved the second choice - the maroon colored shirt! But I agree with you - clothes that feel like butter are def keepers over anything else! The dress looked very comfie! Welcome to our Tuesday Talk crew, so nice to meet you in pictures! I LOVE Loveappella stuff! Sadly I don't own any yet, but it's always SO SOFT. I love the pattern and the style of that dress and am so happy you kept it! You'll get tons of use out of it! I really like the dress that you kept! 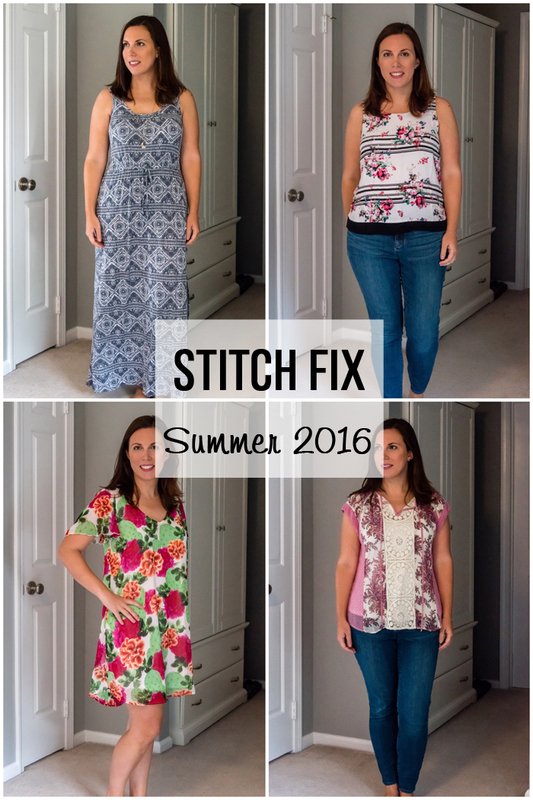 Stitchfix sounds like a great idea. I have a friend who talks about it a lot and does all her shopping that way. i might have to give it a try sometime! You defintely picked the best piece! 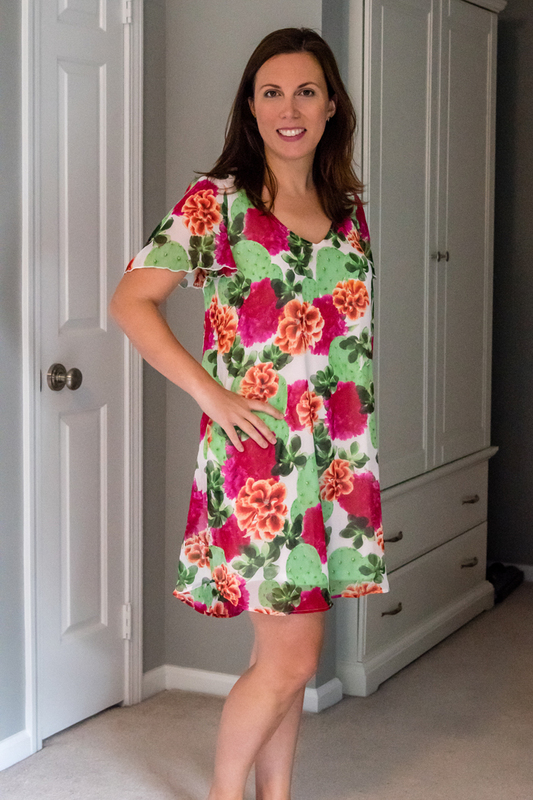 I love all of the prints they sent, but that last dress was a little much with the flowers! And for the price, I think that was a right choice!